Recorded: Hippodrome, Bristol, England May 23rd. 1977. Comments: Alright bootleg from UK 'A Day At The Races' spring tour 1977. This was the opening gig for this UK tour, which covered 11 concerts. Complete show. So far, I haven't come over better recording of this concert. Roots: Original pro-cdr bootleg. From a tape source. I haven't come across more than one tape source of this concert, which is also used on this release. 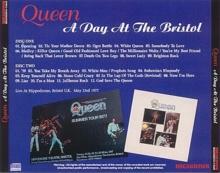 A Day At The Bristol contains the complete tape from Queen's first date in the UK on the Day At The Races tour. Three other shows exist on tape including May 30th Glasgow (released on Gypsy Eye on A Day At The Apollo (GE-145/146)), June 3rd Liverpool and the soundboard recording for June 6th at Earl's Court released both in audio and video many times. The sound quality for the Bristol tape is clear but distant and lacking in significant detail. The audience sings and claps along to many of the song obscuring the action on stage although that is actually a plus for a Queen show which relies upon heavy audience participation to be effective. A small cut during "Brighton Rock" is the only cut on the tape which is otherwise complete and becomes enjoyable once the ears adjust. This tour is significant because it marks the transition between the elaborate production Queen of the mid-seventies and the more stripped down band on News Of The World. Many numbers from Queen II like "Ogre Battle" and "White Queen" would be dropped to never surface again. "You Take My Breath Away" from the new album was performed only on this tour and is a good touch although the sparse arrangement in the live setting strips the song of any of its power. Most of the fun songs from A Day At The Races are played early in the show during the medley. "Killer Queen" is the first song followed by "Good Old Fashioned Lover Boy" (with Freddie again forgetting some words) and "The Millionaire Waltz". "Bring Back That Leroy Brown" with May playing the ukulele is the final song as it has in previous tours. 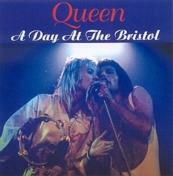 "Death On Two Legs" is introduced by Freddie as a song "we've only just introduced to the set about a nasty old soul". It is played as an independent number and is one of the few times one can hear the second verse. Before "Sweet Lady" Freddie says "This next song is dedicated to all the beautiful ladies in the audience tonight.." and a male voice from the audience shouts "Thank you Freddie! !” Many consider that song to be the weakest on A Night At The Opera but it works very well in a live environment and it is a shame it never appeared again. "White Man" paired with "The Prophet's Song" gives May two solo set pieces in the concert along with "Brighton Rock". On previous tours "Bohemian Rhapsody" was divided into two or three sections scattered throughout the concert but is played as a single song on this tour for the first time. "In The Lap Of The Gods...Revisited" is the set closer.